I hope that you've all enjoyed the past week, wether or not you were stuffing your face with holiday foods. Things are going well around here. In the time since my last craft fair I've been able to spend a little time catching up on projects. (I signed up for another fair this weekend, so the catching up didn't last long). My cousin asked me to make a custom t-shirt for her youngest son. Apparently, the only thing that he has on his Christmas list is a shirt with him first initial on it. Isn't that awesome? Clark's list grows daily, and I fear he'll be horribly disappointed on Christmas day, Wylie however, will probably be perfectly content with him awesome new "W" shirt. I bought a basic long sleeve shirt at Wal-Mart, and turned to my trusty x-acto knife and freezer paper to make a stencil. 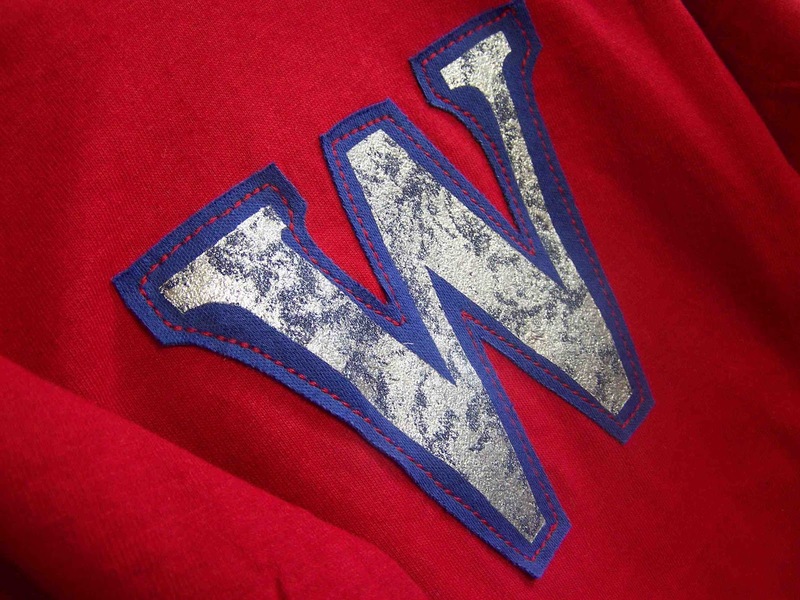 I stenciled a basic serif "W" onto some blue interlock knit. 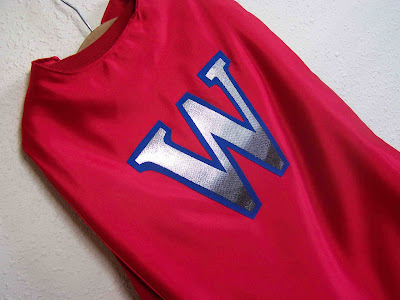 Once the paint was dry I adhered wonder under to the wrong side of the knit, Trimmed the blue knit to leave a small border around the stencil, and appliqued the letter to the shirt. Pretty simple. I used my Super Hero Cape pattern to make him a matching cape. Initially I wanted to design something more elaborate, but my cousin insisted that all he wanted was a W. I actually love how both pieces turned out. I think that the metallic paint, and shiny knit, do a great job of creating a bit more visual interest. So, I'm totally fine with boys wearing metallics. Am I alone in this? Do you think it's okay? I think Wylie would absolutely love this T-shirt. This is probably one of the best gifts he will receive on Christmas. 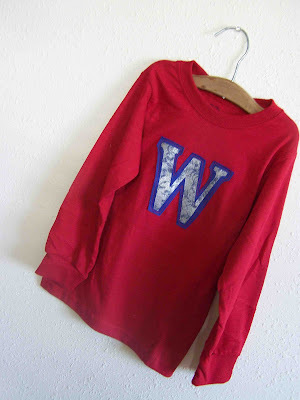 It is so cute, and the “W” initial is perfectly stenciled. You are very creative, Tricia. Great job! This is so cute! I’m pretty sure your son will love this. Your blog gave me an idea as to what to give to my son’s birthday next week. I’d like to create a ‘Batman’ logo on a white t-shirt since he loves ‘Batman’ a lot. I am so much confused when I see those picture....!!! So, Dear, Please come to this shop, and Buy your best one...!! !